Rise to the occasion! The NPS Straight Carpeted Standing Riser is the reliable and affordable choice for your school performances and assemblies. Users are supported by a heavy-duty, 16-gauge steel, black powder-coated frame. The premium 3/4" thick plywood deck is durable and features a firmly-affixed carpeted surface. 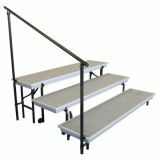 Legs are constructed with 14-gauge steel tubing and feature simple and safe spring-loaded locking mechanisms allowing for quick set-up assembly and folds up easily for manageable portable storage. 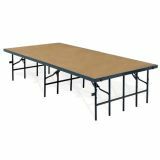 The stage offers a secure weight capacity of over 200 lbs. per square foot. 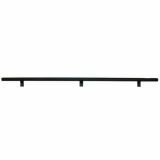 High-impact plastic glides will ensure floors are protected from damage. Firmly welded ganging devices let users combine equal-height stages to create a large single stage platform or assemble different sizes to create standing riser configurations. Ships fully assembled. Rise to the occasion! 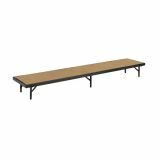 The NPS Straight Hardboard Standing Riser is the reliable and affordable choice for your school performances and assemblies. Users are supported by a heavy-duty, 16-gauge steel, black powder-coated frame. The premium 3/4" thick plywood deck is durable and features a firmly-affixed hardboard surface. 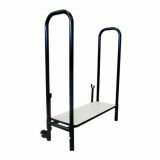 Legs are constructed with 14-gauge steel tubing and feature simple and safe spring-loaded locking mechanisms allowing for quick set-up assembly and folds up easily for manageable portable storage. 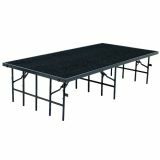 The stage offers a secure weight capacity of over 200 lbs. per square foot. High-impact plastic glides will ensure floors are protected from damage. Firmly welded ganging devices let users combine equal-height stages to create a large single stage platform or assemble different sizes to create standing riser configurations. Ships fully assembled. Safety first! 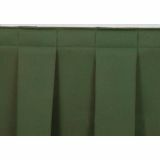 Protect the stars of the show with NPS heavy-duty guardrails. 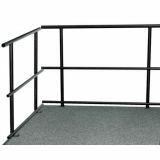 Side guard rails for Trans-Port risers are constructed entirely of 14 -gauge black powder coated steel, and are outfitted with high-impact plastic end caps. 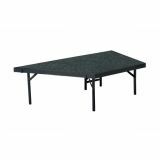 The NPS Portable Carpeted Stage Pie is used to create customized bow, oval or ring-shaped configurations. 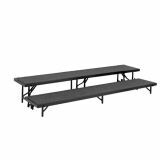 It's the reliable and affordable choice for your school performances and assemblies. Users are supported by a heavy-duty, 16-gauge steel, black powder-coated frame. The premium 3/4" thick plywood deck is durable and features a firmly-affixed carpeted surface. 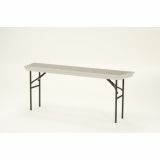 Legs are constructed with 14-gauge steel tubing and feature simple and safe spring-loaded locking mechanisms allowing for quick set-up assembly and folds up easily for manageable portable storage. 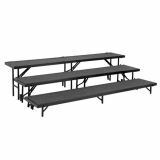 The stage offers a secure weight capacity of over 200 lbs. per square foot. High-impact plastic glides will ensure floors are protected from damage. 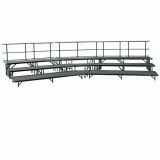 Firmly welded ganging devices let users combine equal-height stages to create a large single stage platform or assemble different sizes to create choral or band riser configurations. Ships fully assembled. 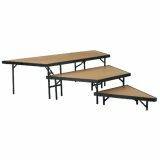 The NPS Portable Hardboard Stage Pie is used to create customized bow, oval or ring-shaped configurations. 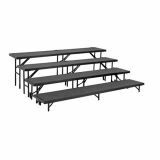 It's the reliable and affordable choice for your school performances and assemblies. Users are supported by a heavy-duty, 16-gauge steel, black powder-coated frame. The premium 3/4" thick plywood deck is durable and features a firmly-affixed 1/8" thick tempered hardboard surface. Legs are constructed with 14-gauge steel tubing and feature simple and safe spring-loaded locking mechanisms allowing for quick set-up assembly and folds up easily for manageable portable storage. The stage offers a secure weight capacity of over 200 lbs. per square foot. High-impact plastic glides will ensure floors are protected from damage. 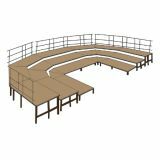 Firmly welded ganging devices let users combine equal-height stages to create a large single stage platform or assemble different sizes to create choral or band riser configurations. Ships fully assembled. 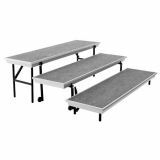 The NPS Portable Carpeted Stage Set is the reliable and affordable choice for your school performances and assemblies. Users are supported by a heavy-duty, 16-gauge steel, black powder-coated frame. The premium 3/4" thick plywood deck is durable and features a firmly-affixed carpeted surface. 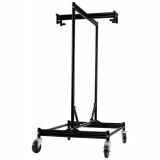 Legs are constructed with 14-gauge steel tubing and feature simple and safe spring-loaded locking mechanisms allowing for quick set-up assembly and folds up easily for manageable portable storage. 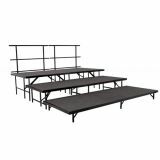 The stage offers a secure weight capacity of over 200 lbs. per square foot. High-impact plastic glides will ensure floors are protected from damage. 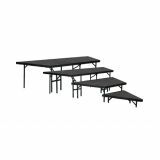 Firmly welded ganging devices let users combine equal-height stages to create a large single stage platform or assemble different sizes to create choral or band riser configurations. 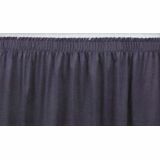 This set includes 14-gauge guardrails for extra safety.